We’re now in the Top 16! Nicholas Petzold from Austin, Texas ended the Swiss Rounds in 11th place with a 8-2 record. He has an interesting Deck that centers around Metalfoes but also contains Purple Poison Magician and Astrograph Sorcerer, plus enough True Draco Spells and Traps to support Master Peace, the True Dracoslaying King! 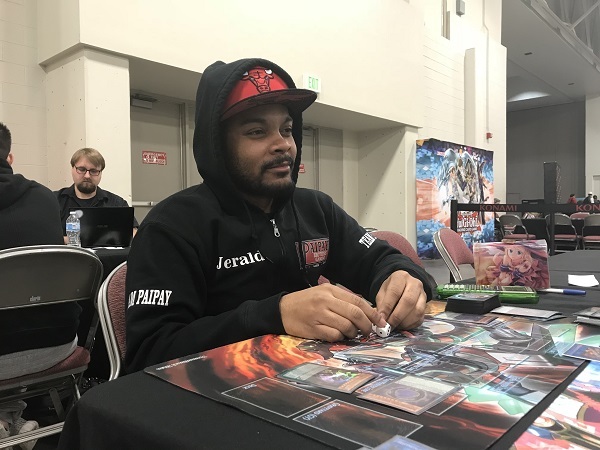 He’s made it to Top 16 and is facing off against Jerald Acosta from New Jersey, who ended Swiss in 6th place with a record of 9-1 using a Pendulum Magician Deck. Only one of these players will move on to the Top 8. It’s time to Duel! Petzold won the roll and elected to go first. He started with a hand of Metalfoes Combination, Terraforming, Dragonic Diagram, Metalfoes Steelen, and Rescue Rabbit. He Set Metalfoes Combination and activated Dragonic Diagram, using the effect to destroy Metalfoes Combination and add Master Peace, the True Dracoslaying King from his Deck to his hand. He used the Graveyard effect of Metalfoes Combination to add Metalfoes Goldriver from his Deck to his hand. He then Normal Summoned Rescue Rabbit and activated its effect, banishing it to Special Summon the other 2 Metalfoes Goldrivers from his Deck. He used both Goldrivers to Link Summon Heavymetalfoes Electrumite. He used the effect to send Astrograph Sorcerer from his Deck to the Extra Deck. Petzold then activated Metalfoes Steelen and used the effect to destroy Dragonic Diagram and Set Metalfoes Combination from the Deck. He activated Terraforming to get another Dragonic Diagram and activated that, popping Metalfoes Combination to add True Draco Heritage and using Metalfoes Combination to add Metalfoes Volflame. Petzold then activated Goldriver and used Heavymetalfoes Electrumite’s effect to destroy Metalfoes Steelen and add Astrograph Sorcerer form his Extra Deck back to his hand. Its effect let it Special Summon itself and added Metalfoes Steelen from his Deck to his hand. Heavymetalfoes Electrumite’s effect drew Upstart Goblin which was activated to draw another Astrograph Sorcerer. Petzold then activated another Metalfoes Steelen. He then used Goldriver’s Pendulum Effect, destroying Metalfoes Steelen and Setting Metalfoes Fusion from the Deck. The second Astrograph Sorcerer was Special Summoned adding Steelen from the Deck to the hand. 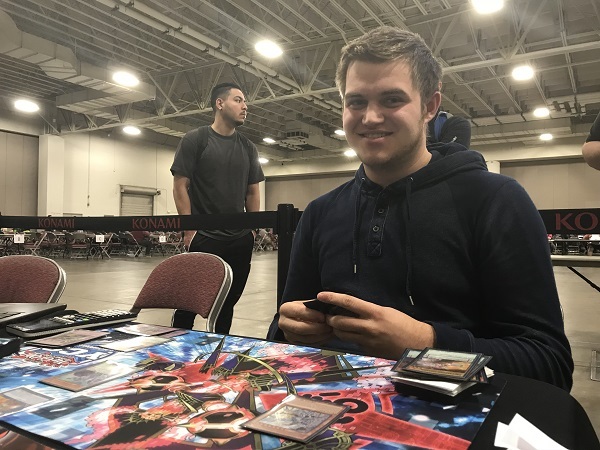 Steelen was activated, then Petzold Pendulum Summoned 2 Goldrivers from the Extra Deck and a Metalfoes Volflame from his hand. He used the Goldrivers to Xyz Summon Tornado Dragon, then used the 2 Astrograph Sorcerers to Xyz Summon Odd-Eyes Absolute Dragon. He activated True Draco Heritage and used the additional Tribute Summon, Tributing Odd-Eyes Absolute Dragon and True Draco Heritage to Tribute Summon Master Peace, the True Dracoslaying King! 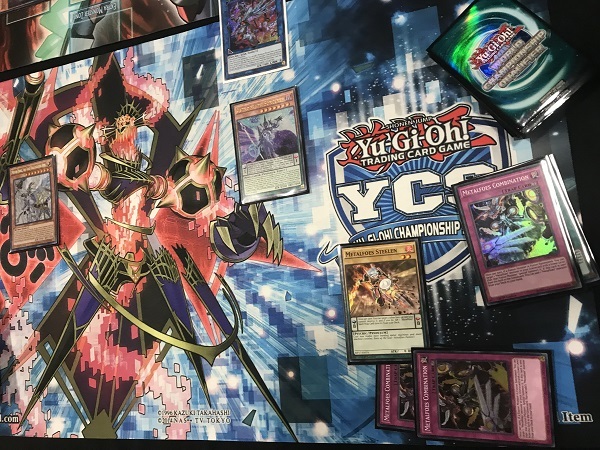 He used Odd-Eyes Absolute Dragon’s effect to Special Summon Odd-Eyes Vortex Dragon from the Extra Deck. He then activated the Set Metalfoes Fusion, using Heavymetalfoes Electrumite and Metalfoes Volflame to Fusion Summon Fullmetalfoes Alkahest. He then used Metalfoes Fusion’s Graveyard effect, shuffling it back to the Deck to draw Rescue Rabbit. He then used Metalfoes Steelen’s effect, destroying Metalfoes Goldriver to Set Metalfoes Combination from the Deck. Acosta drew for turn. He activated Foolish Burial, sending Supreme King Dragon Darkwurm from the Deck to the Graveyard. He then activated Allure of Darkness, drawing 2 cards and banishing another Supreme King Dragon Darkwurm. Acosta then activated Supreme King Dragon Darkwurm’s effect in the Graveyard to Special Summon it and then used the effect to add Supreme King Gate Zero from the Deck to the hand. He had Supreme King Dragon Darkwurm attack Petzold’s Fullmetalfoes Alkahest but Petzold used Fullmetalfoes Alkahest’s effect to equip Acosta’s Supreme King Dragon Darkwurm to it. In Main Phase 2, Acosta activated Chronograph Sorcerer in the Pendulum Zone and used the effect to destroy it to Special Summon Timegazer Magician. Acosta then Normal Summoned another Supreme King Dragon Darkwurm and used the 2 monsters to Link Summon Heavymetalfoes Electrumite. He activated the effect, but Petzold Chained Master Peace, the True Dracoslaying King to destroy it. Acosta sent Astrograph Sorcerer to the Extra Deck to complete the effect of Heavymetalfoes Electrumite. He activated Harmonizing Magician in the Pendulum Zone followed by Supreme King Supreme King Gate Zero, but Petzold Chained the effect Tornado Dragon to destroy Harmonizing Magician. Acosta conceded the Duel, too far behind to deal with the field. Acosta elected to go first in Duel 2. He started off with Dragon Shrine, sending Supreme King Dragon Darkwurm from the Deck to the Graveyard, which was Special Summoned. Its effect added Supreme King Gate Zero from his Deck to his hand. Acosta Normal Summoned Timegazer Magician, but Petzold activated Ghost Reaper & Winter Cherries, revealing Heavymetalfoes Electrumite! Acosta banished 2 copies and Petzold got a look at Acosta’s Extra Deck. Acosta proceeded to activate Supreme King Gate Zero and Chronograph Sorcerer, then Pendulum Summoned Mythical Beast Jackal King and Harmonizing Magician from his hand! He used Harmonizing Magician’s effect to Special Summon Black Fang Magician from his Deck. He used Harmonizing Magician and Black Fang Magician to Xyz Summon Evilswarm Nightmare. Petzold drew Metalfoes Goldriver, adding it to his hand of Purple Poison Magician, 2 copies of Metalfoes Silverd, and Metalfoes Steelen. He activated Metalfoes Goldriver and Purple Poison Magician as Pendulum Spells, with Mythical Beast Jackal King gaining 4 counters. Petzold used Goldriver’s effect, destroying Purple Poison Magician and setting Metalfoes Fusion from the Deck. Purple Poison Magician’s effect destroyed Acosta’s Evilswarm Nightmare. Petzold then activated Metalfoes Fusion, sending 2 Metalfoes Silverds from his hand to the Graveyard to Fusion Summon Metalfoes Mithrilium. He then used Metalfoes Fusion’s Graveyard effect to shuffle it back into the Deck and draw Terraforming which was immediately activated to add Dragonic Diagram to his hand. He then activated Metalfoes Mithrilium’s effect, targeting the SIlverds and Acosta’s Mythical Beast Jackal King, which Acosta Chained to negate and destroy Metalfoes Mithrilium. Mithrilium’s Graveyard effect Special Summoned a Silverd from the Graveyard. Petzold then activated Steelen and used it to destroy Goldriver to Set Metalfoes Combination. He then activated Dragonic Diagram to destroy Metalfoes Combination and add Master Peace, the True Dracoslaying King to his hand. Combination’s effect added another Metalfoes Steelen to his hand. He then activated Metalfoes Silverd and used the effect, destroying Dragonic Diagram to Set Metalfoes Combination. He then Tributed Metalfoes Combination and Metalfoes Silverd to Tribute Summon Master Peace, the True Dracoslaying King. He used Metalfoes Combination to add Metalfoes Volflame from his Deck to his hand. Petzold then Pendulum Summoned Goldriver and Volflame, and then used both monsters to Link Summon Heavymetalfoes Electrumite. He used the effect to send Astrograph Sorcerer from the Deck to the Extra Deck. He then activated Heavymetalfoes Electrumite’s effect, destroying Steelen and adding back Astrograph Sorcerer, whose effect Special Summoned it and added another Steelen from the Deck to his hand. Heavymetalfoes Electrumite’s draw effect found Petzold an Ash Blossom & Joyous Spring. Petzold then activated Master Peace, the True Dracoslaying King’s effect, destroying Acosta’s Mythical Beast Jackal King. All of his monsters attacked to clear the field to drop Acosta down to 3750 LP. In Main Phase 2, Petzold placed Steelen in the Pendulum Zone and used the effect to destroy Silverd. He Set Metalfoes Combination from the Deck. Acosta drew to 1 card in hand. He Pendulum Summoned Supreme King Gate Zero from his hand along with Mythical Beast Jackal King from the Extra Deck. Mythical Beast Jackal King attacked, but Petzold used Master Peace, the True Dracoslaying King to destroy Acosta’s Jackal King. Petzold drew Ghost Reaper & Winter Cherries. He activated Metalfoes Combination, then used the Pendulum Effect and Acosta extended the handshake! Nicholas Petzold moves on to Top 8! 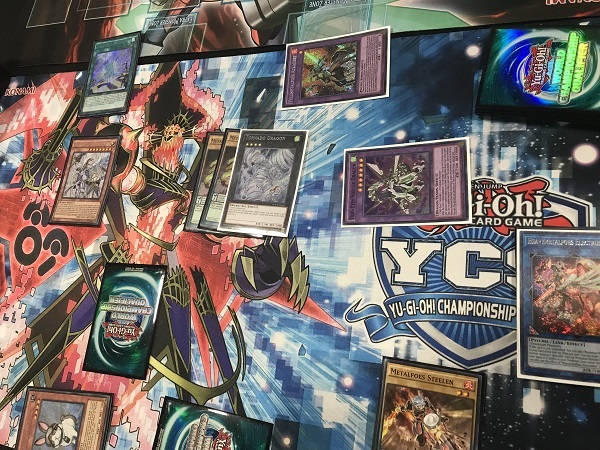 Check Out Which Duelists And Decks Are Dueling In The Top 8! Sunday’s Generation Duel Top 4!